Browse our large collection of cushion cut solitaire diamond engagement rings and find your perfect ring. This stylish modern cut suits everyone. A cushion cut diamond is a classic beauty that will always be preferred by those who appreciate the subtlety of the cut that is a blend of both princess and oval shapes. It is an antique style and since the demand for this cut isn’t as large as other cuts, not too many contemporary cushion styles are in the market. 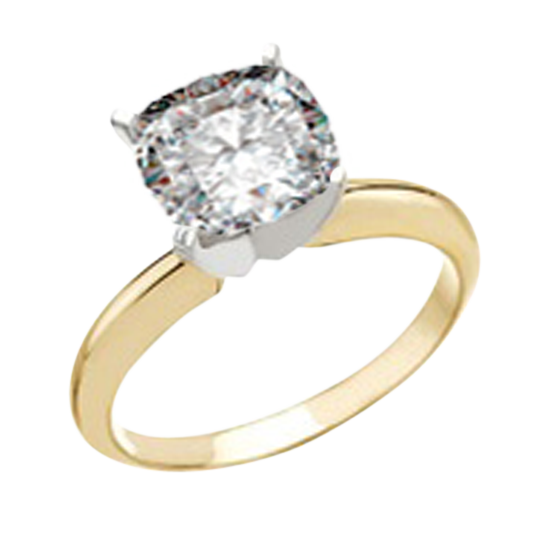 At CaratsDirect2U we offer cushion cuts that are set as a solitary stone in a four-prong setting. Without the accents, a cushion cut diamond ring is simple, but still elegant. We carry many 0.5-1.50 carats in a large range of colors and different clarity. We also carry many different fancy colored cushion diamonds both natural colors and treated, and of course they can be set in either 14k yellow gold or 14k white gold.